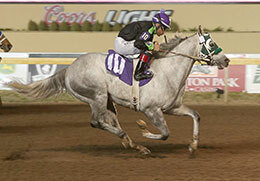 August Rush Gl, under jockey Agustin Silva, blew the competition away in his Remington Park debut Friday night. OKLAHOMA CITY, OK�APRIL 1, 2016�Friday night�s feature at Remington Park was an allowance-optional $35,000 claiming race at 330 yards. August Rush GL took advantage of the allowance condition for non-winners of four career races and blew the competition away by 1-1/4 lengths in his Remington Park debut. The first outing of 2016 ran the win streak for August Rush GL to three straight races, dating back to October last year. Owned by the Garza Laurel Partnership of Laredo, Texas, August Rush GL is trained by Rick Robinson and was ridden by Agustin Silva. The 4-year-old gray horse handled the distance in :16.389 seconds over a fast track. Blazin Hero chased the winner in second with Quarter Focus another neck behind in third. Away at 7-2 in the wagering, August Rush GL paid $9.40 to win, $5.80 to place and $3.60 to show. Blazin Hero returned $5 to place and $4.40 to show as the beaten betting favorite, at 7-2 odds. Quarter Focus paid $3.80 to show. An Oklahoma-bred son of IVORY JAMES from the Devon Lane (TB) mare Grande Annee, August Rush GL won his fourth career race from 12 attempts. The first-place check of $9,804 moves his total bankroll to $45,865.